Home • News • The Orchid Doctor Will See You Now At Squire’s Garden Centres! The Orchid Doctor Will See You Now At Squire’s Garden Centres! Scared of orchids? It might sound a little over-dramatic but Squire’s Garden Centres has found that many local gardening enthusiasts can be intimidated by what is often voted the UK’s favourite flower! Squire’s has the cure. Six of its garden centres across Surrey are hosting a series of special ‘Orchid Talk’ events (19-23 March) where orchid expert Dr. Manos Kanellos will share the secrets of how to care for these stunningly beautiful but delicate plants. In an entertaining and informative 45-minute presentation Manos will cover everything from plant selection and basic care to re-potting and re-blooming, taking the fear out of orchids! The ticket-only events will also include an open Q&A session and the audience are even invited to bring along their own orchids for Manos to guide them through a special ‘Orchid MOT’. “Because orchids are tropical plants they certainly benefit from care tailored to their needs, but it’s actually pretty straightforward if you follow some simple advice. We have organised these special events because many customers tell us they would love to grow orchids but feel slightly intimidated by the thought of caring for them. Tickets are £10 and include a drink and a special voucher offering £5 off selected orchids bought on the day of the event. Places are limited so book in-store or online now at www.squiresgardencentres.co.uk. 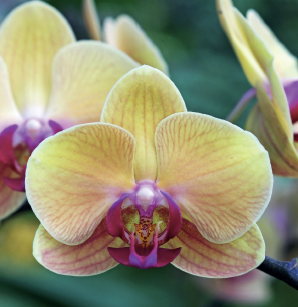 Event: Orchid Talk and bring you own orchid for an MOT!